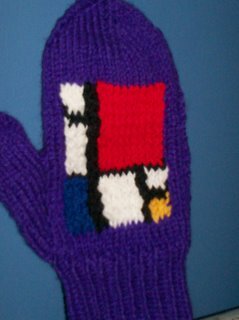 fecknom knits: My First Mitten! That's a REALLY cute mitten. Are you signed up on the BM site? You should post a link over tehre so others can see this. It's great! Hey! Neat! I wonder what they'd look like with a different main color. For instance, I think a grey background might let the blue pop. A grey background would indeed look cool, especially because Mondrian used grey sometimes, too. (I chose purple to use up some of my Red Heart stash.) Black might add an interesting effect, too, blending in with the lines. how are you so good at knitting? i understand you have much more patience than i do... if only i could stick with it long enough to have a finished SOMETHING. i've got about 3 projects lying around half finished. oops.